So, Amp is back. Or maybe they never really left and i simply drifted away from them for a while. ''Drifting'” ... that is a good word to associate with Amp. Amp is an ambient duo consisting of Richard Walker (aka, Richard Amp) and Karine Chariff. And/or other people. But mostly the two of them. Except at the very beginning (1992) when Chariff was not in the picture yet. 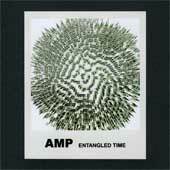 Amp's music is amorphous, droning, spacious and reverberating and clean and light and free and delicate. It ebbs and flows in odd ways. This is their first release in three years, and their previous release was a live album! Wow, to see this sort of thing performed live... I have seen very little ambient music performed live. But perhaps that is due to where i live. Will Amp go on tour for this release? Where would they even play in Atlanta??? This record is five tracks, one of which is an extended mix of one of the other tracks. That is very Amp. The songs float in and out with layers of voice, synths, keyboards, guitars... Or maybe this is all done on a computer. Everything involving Amp is kind of vague and indeterminate. The first track here is the ten minute Drifting, and i find it hard to believe that Amp have not used this name for a track before, but here we are. This grows slowly with layers of synths and strings. Chariff's voice is faint in the background, another layer of sound ebbing in and out. At about 7:20 in, the music fades out, slowly replaced by a whipping wind and rolling water sound, like the song has ended and we are left on a windswept beach, desolate, alone, the wind tearing past as the water drifts in and out and we sit, listening to this desolation in the cold (the wind noise feels cold to me) until the song fades out at just over ten minutes. I find that listening to the wind for almost three minutes wears a little thin after a while, and eventually i skip to the next tune. Which is called Will-Oh Dreams and it starts with Chariff singing faintly against a tinkling layer of guitar (i think). Percussion comes in -- the sound of someone hunting and pecking on a typewriter and then eventually that sound is swallowed by electronicness. It fades out and we have two voices over the haze, as Walker joins in with a faint vocal layer to accompany Chariff. And then at 2:10 seconds a beat comes in, and angry insistent thud, a loop lost from some kind of rave tune that just ended up here. It drives the haze along, and eventually more percussion elements and droning layers join in. This is an odd song, with a driving beat and a hazy feel. But i think it works. Amp can pull this kind of thing off. Playing Time, the next track, is barely an Amp tune at all as it wraps up in under two and a half minutes! This is wavering and vaguely tinkling, a faint haze that floats in and out. Opal Tears is five minutes in length, which is better for this band. This is similar to Drifting in that it is layers of haze with Chariff's voice layered in it, but the haze here is more ringing, like a faint and very slow chiming. That is the end of the album proper, i suppose. At least, that is the end of the new Amp tunes. The final track is an "extended mix" of Will-Oh Dreams, in case the eight minutes of that tune did not satisfy you and you wish it was twice as long. In that case, don't worry, because Amp end this record with 16 minutes of hazy ambiance and clicking thumping beats. Actually, that's a good thing. The extended version stretches the song out a little, giving it some natural breathing room. I approve. So this is pretty good ambient pop. As one would expect from this long running project.